We hope this finds you well as the humidity of the rainy season settles in. 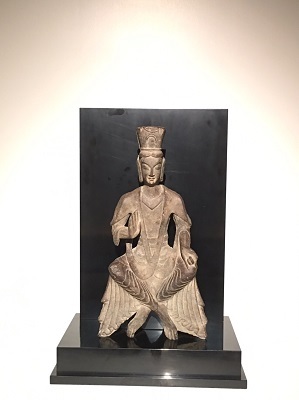 Our current exhibition at the Shirokane gallery is of Chinese stone Buddhist sculpture, centered around pieces from the Xiangtangshan cave complex. Xiangtangshan is a group of cave temples in modern-day Hebei province, the earliest of which dates back to the tumultuous sixth-century Northern Qi Dynasty (550 - 577). The three pieces in the center are believed to have been individual sides of an octagonal pedestal, each featuring a different monster that would have supported a larger Buddhist sculpture situated above them. The poses they strike as they bolster the pedestal express the great exertions each makes to bear the weight. 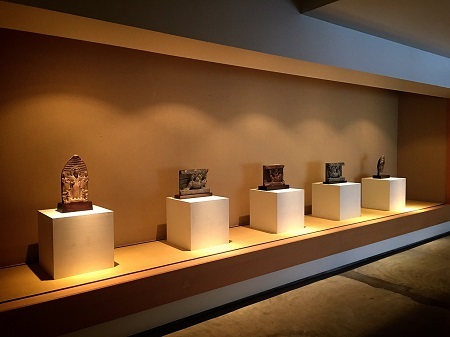 In addition to the three here, The Cleveland Museum of Art, Denver Art Museum, and the Sackler Collection in New York's Colombia University each have a piece in their collections, meaning that a total of six pieces can be identified and located at present. A number of other powerful pieces are on display as well, so please do stop by to see the show!